pidTuner(sys,type) launches the PID Tuner app and designs a controller of type type for plant sys. pidTuner(sys,Cbase) launches PID Tuner with a baseline controller Cbase so that you can compare performance between the designed controller and the baseline controller. If Cbase is a pid, pidstd, pid2 or pidstd2 controller object, PID Tuner designs a controller of the same form, type, and discrete integrator formulas as Cbase. pidTuner(sys) designs a parallel-form PI controller. pidTuner launches PID Tuner with default plant of 1 and proportional (P) controller of 1. Any SISO LTI system (such as ss, tf, zpk, or frd). Any System Identification Toolbox™ SISO linear model (idtf, idfrd, idgrey, idpoly, idproc, or idss). Stable, unstable, or integrating. However, you might not be able to stabilize a plant with unstable poles under PID control. then you must specify the number of unstable poles in the plant. To do this, after opening PID Tuner, in the Plant menu, select Import. In the Import Linear System dialog box, reimport sys, specifying the number of unstable poles where prompted. When you use the type input, PID Tuner designs a controller in parallel form. If you want to design a controller in standard form, Use the input Cbase instead of type, or select Standard from the Form menu. For more information about parallel and standard forms, see the pid and pidstd reference pages. Use the input argument Cbase instead of type. PID Tuner reads controller type, form, and discrete integrator formulas from the baseline controller Cbase. In PID Tuner, click Options to open the Controller Options dialog box. Select discrete integrator formulas from the Integral Formula and Derivative Formula menus. For more information about discrete integrator formulas, see the pid and pidstd reference pages. A dynamic system representing a baseline controller, permitting comparison of the performance of the designed controller to the performance of Cbase. Is the type represented by Cbase. Is a parallel-form controller, if Cbase is a pid controller object. Is a standard-form controller, if Cbase is a pidstd controller object. Is a parallel-form 2-DOF controller, if Cbase is a pid2 controller object. Is a standard-form 2-DOF controller, if Cbase is a pidstd2 controller object. Has the same Iformula and Dformula values as Cbase. For more information about Iformula and Dformula, see the pid and pidstd reference pages . If Cbase is any other dynamic system, PID Tuner designs a parallel-form PI controller. You can change the controller form and type using the Form and Type menus after launching PID Tuner. PID Tuner designs a controller for Gd having the same form, type, and discrete integrator formulas as Cbase. For comparison, you can display the response plots of Cbase with the response plots of the designed controller by clicking the Show baseline checkbox in PID Tuner. PID Tuner has a default target phase margin of 60 degrees and automatically tunes the PID gains to balance performance (response time) and robustness (stability margins). Use the Response time or Bandwidth and Phase Margin sliders to tune the controller's performance to your requirements. Increasing performance typically decreases robustness, and vice versa. 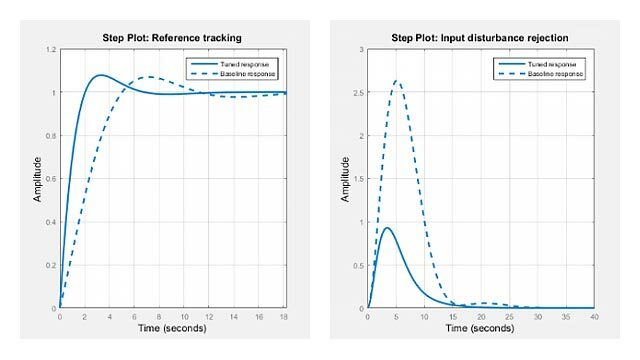 Select response plots from the Response menu to analyze the controller's performance. If you provide Cbase, check Show baseline to display the response of the baseline controller. For more detailed information about using PID Tuner, see Designing PID Controllers with PID Tuner. You can open PID Tuner from the MATLAB® desktop, in the Apps tab. When you do so, use the Plant menu in PID Tuner to specify your plant model. For PID tuning at the command line, use pidtune. The pidtune command can design a controller for multiple plants at once.